Cutting heads are a vital part of any waterjet cutting system. After all, it is here where the arriving force of the water of up to 6,200 bar is focused to become a precise jet – a prerequisite for waterjet cutting. As for all components of a cutting system, long lifetimes and easy maintenance and repair are very important for cutting heads to keep downtimes of the system as rare and short as possible. In the end, an out of order machine does not generate any turnover. And when it comes to contract cutting, flexibility of the cutting heads is also relevant: The machine operator may quickly have to change from abrasive to pure water operation due to the broad range of different materials which have to be cut in such a job shop. For many machine operators, the cutting head of choice is the KMT model ACTIVE IDE. This cutting head only consists of a minimum amount of single components thus offering very easy handling and a low maintenance effort. In case of maintenance, the only wear part in the assembly, which is the focusing tube, can be replaced quickly and easily. Moreover, the diamond orifice always guarantees an optimally adjusted waterjet because it is firmly integrated into the nozzle body. Especially contract cutters appre-ciate the possibility to convert the ACTIVE IDE abrasive cutting head to a pure water cutting head without any difficulties. To do so, the actual IDE cutting head merely has to be screwed off and a respective adapter including a pure water orifice has to be screwed on. In the development of the necessary components, the KMT team has adjusted the dimensions of the adapter to fit the dimensions of the IDE body. In this way, the converted cutting head does not have to be aligned in z direction thus making the conversion from abrasive to pure water operation very feasible. 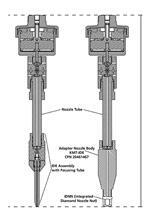 When the cutting head is converted, the adapter can be equipped with two different orifices. On the one hand, there is the conventional sapphire or diamond orifice, which is mounted to the adapter with a nozzle nut. On the other hand, there is the possibility to use an IDNN (Integrated Diamond Nozzle Nut) pure water orifice – a nozzle nut with firmly integrated diamond orifice. Such an assembly features many advantages: First of all, diamond orifices are very reliable and have longer lifetimes compared to sapphire. In this respect, the pre-alignment of the IDNN assembly still optimizes the lifetime and additionally assures a highly accurate and very long jet. More important still when it comes to converting the cutting head from abrasive to pure water operation, the integrated diamond orifice is much more robust than the conventional one and can be easily mounted to the orifice tube thus eliminating the chance of mis-alignment of the jet. And, due to its bigger dimensions, it is easier to spot, so the risk of losing it during change-outs is minimized. To further optimize the lifetime of a cutting head, the application of a pre-filter is recommended. 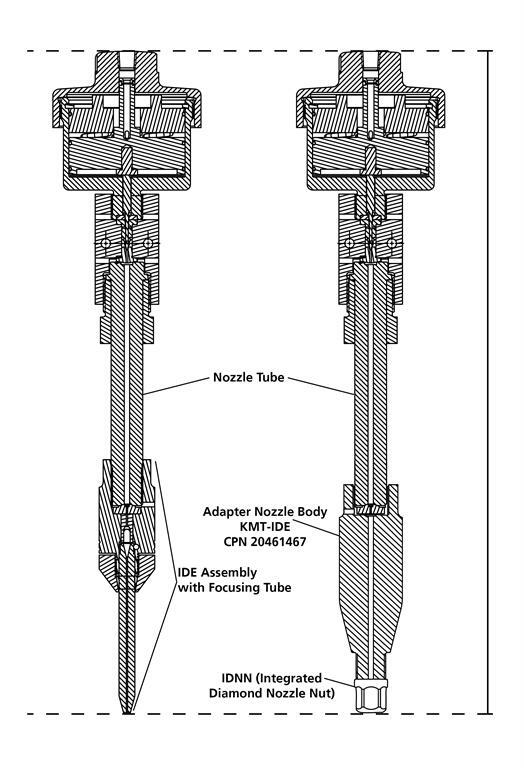 It is installed directly at the nozzle valve and holds off pollutants from the piping system. If these dirt particles enter the cutting head, they can have a negative influence on the life-time of the orifice. 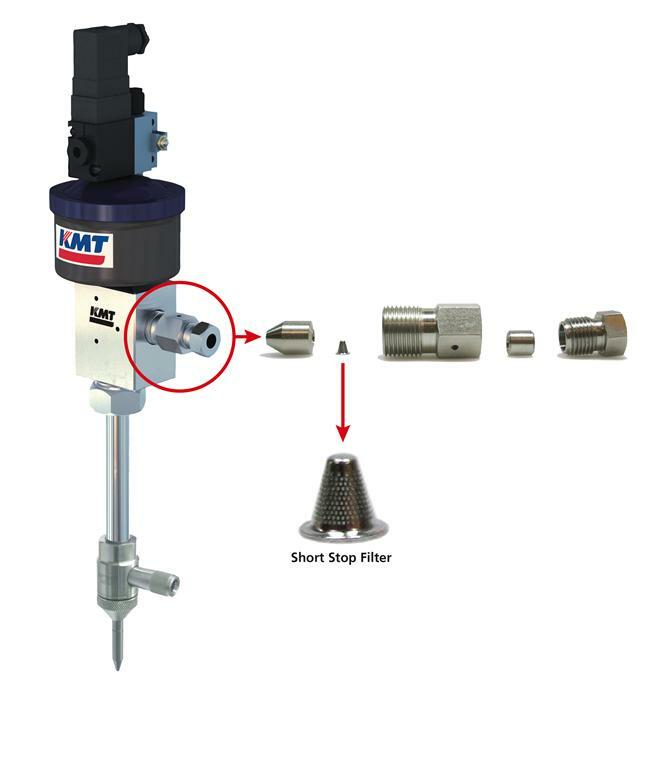 The pre-filter is a standard component in the ACTIVE IDE cutting head and can be retrofitted to all KMT Waterjet and H2O Jet cutting heads without a problem. To do so, KMT offers different assembly groups with 1/4” or 3/8” gland nut.